Leo Foy and his wife, Kelly, from Berlin, Vermont, drove out to Missouri last July. “We took about a week, made a little trip out it,” said Foy. The impetus was to pick up four beer serving tanks from the Paul Mueller Company in Springfield, haul them back to Vermont and set them up in time for the December 15, 2017 opening of the Dog River Brewing Company on Route 302 in Berlin. That made Dog River Vermont’s newest brewery, though it held the title for less than a month. 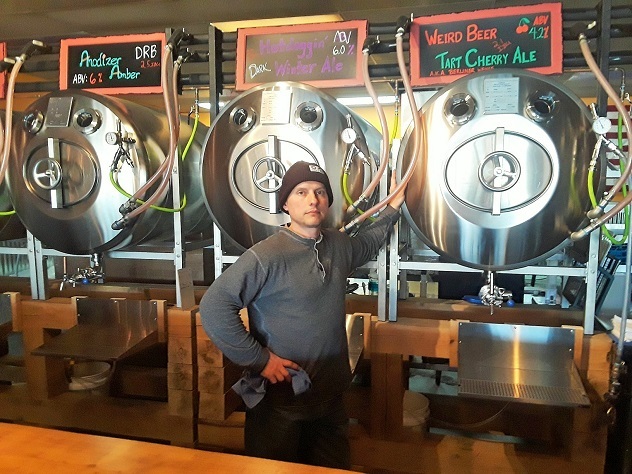 On January 13 the Killington Beer Company opened in a former restaurant and kitchen space within the Terra Median building at The Woods off Killington Road. “How long do you think we’ll be Vermont’s newest brewery?” asked Vince Wynn, one of the Killington partners, in a tone that suggested that long might not be the right word. If the latest, the pair by no means exhausts the list of the state’s new or newish breweries: Cousins Brewing started serving beers in the Localfolk Smokehouse in Waitsfield, Mill River Brewing BBQ & Smokehouse opened in St. Albans, the seasonal Next Trick Brewing opened and closed in West Burke (it’s reopening in May) and Harvest Brewing has been humming along in Bennington. Clearly there’s more work to be done to canvas all of Vermont’s 56 or so breweries (I’m finding an exact count an elusive target). 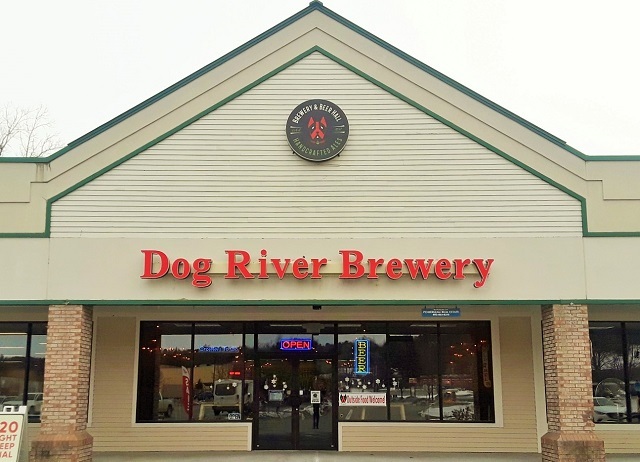 I did manage to visit Dog River and Killington Beer one day in late January; both seem off to promising starts, if with different approaches. Foy is taking the One Man Band tack, although his wife pitches in on what have been very lively weekends so far, and their son, also Leo, helped his dad put the tasting room and brewery together. They did impressive work. One of only three Vermont breweries in busy retail locations (the others being the Saint J Brewery in St. Johnsbury and 14th Star Brewing in St. Albans), Dog River is in a former Radio Shack building transformed into a sort of Americana beer hall, with picnic benches and upright tables scattered around a fairly cavernous space. There are shelves of board games, a busy popcorn machine and a hot dog rotisserie. 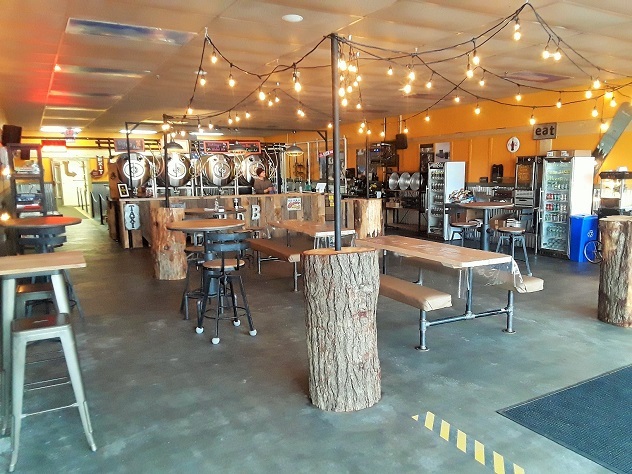 The centerpiece is the hemlock bar, made out of young Leo’s former tree house, and behind it the four gleaming serving tanks carted from Missouri, now in full service and dispensing quite a bit of beer, especially on Fridays and Saturdays. From southern New Jersey, Foy came to Vermont to attend Norwich University. He graduated with a degree in mechanical engineering and set about to work largely in oil and gas industries all over the world, based mainly in Texas, where he met his wife-to-be. They decided to raise their son in Vermont. Leo continued with his engineering work while Kelly became a data analyst with the Central Vermont Medical Center. Kelly handles the books. Foy estimates he put about $100,000 into the location: “I haven’t asked my wife for the exact figure; I’m kind of afraid to know.” The couple has achieved goal one: opening the doors and starting to pay bills. Foy likes being different, and had no interest in dealing with food at the tasting room. So they put out the word that they’re outside food friendly, meaning visitors can bring in whatever food they want to have with their beer. Foy also considers brewing in traditional styles—English ales, European lagers—different in this day and age. No hazy double IPAs? “Not my thing,” he said. 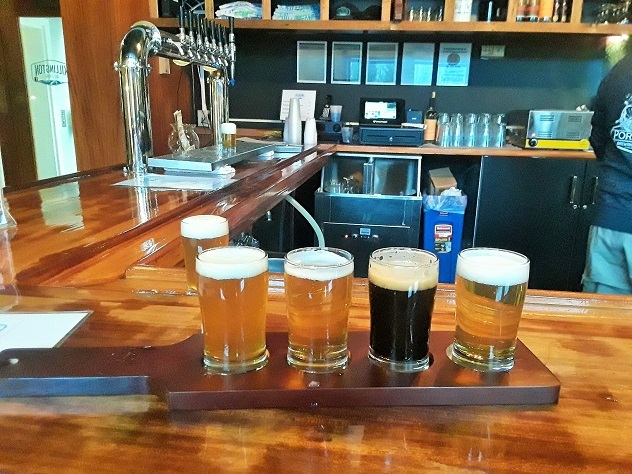 He had four beers on tap, a 6% ABV pale ale (Dog Pail Ale), a 6.2% amber ale (Anodizer Amber), a 6% dark brown ale or porter (Hotdoggin’ Winter Ale) and on what he called his Weird Beer tap, a 4.2% Tart Cherry Ale, that we both thought was a little weird indeed. I transported home a crowler of Hotdoggin’ Winter Ale and pondered that I wouldn’t mind stopping by on a Friday or Saturday night myself. When I wandered into the Killington Beer Company it was a little like the dance was underway while the decorating committee was still at work. The former restaurant space was still a bit barren, yet the fireplace was lit, six tap lines were flowing, and brewing was afoot. Mike Philbrick, Killington Beer Co.
Philbrick and some of the other staff on hand were sporting Port Jeff logos on their shirts, and indeed some of the Long Island staff have been traveling north to help out in the early going. 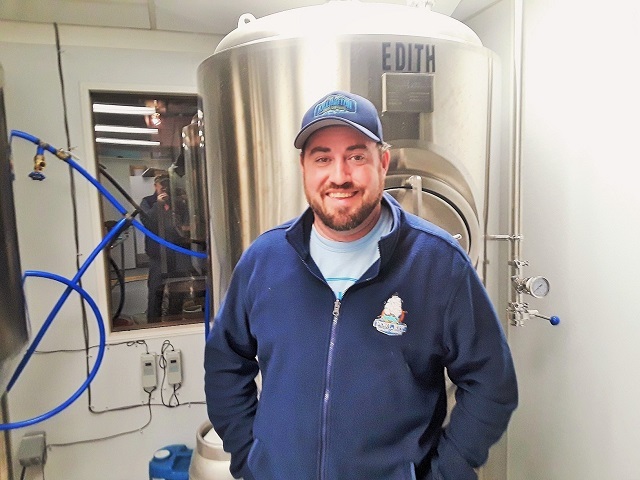 Philbrick lives on Long Island, but he’s been in Vermont weekly to oversee the new brewing operations. His partner, Vince Wynn, lives in Killington and worked here in the ski industry. It may not be a coincidence that some of the names of KBC’s beers bear resemblance to nearby ski trails. The current lineup includes a 4.7% golden ale (Magic Carpet), an appealing 5% blonde ale infused with organic strawberries (Darryl), a 6% IPA (K-Won), a 9% double IPA (Double DIPA, naturally) and, indeed, the impressively roasty 5.7% Super Stout. For a Vermont double IPA, the Double DIPA is surprisingly clear. “It sure is,” said Philbrick, unafraid to run the gauntlet: “I love a lot of IPAs that come out of Vermont, but I like clarity in a beer. Not to say there aren’t plenty of brews that are hazy and excellent, like Fiddlehead’s Second Fiddle. Farnham has been doing some great ones. Others, not necessarily the case. Bold talk. But no one opens a brewery without being bold.